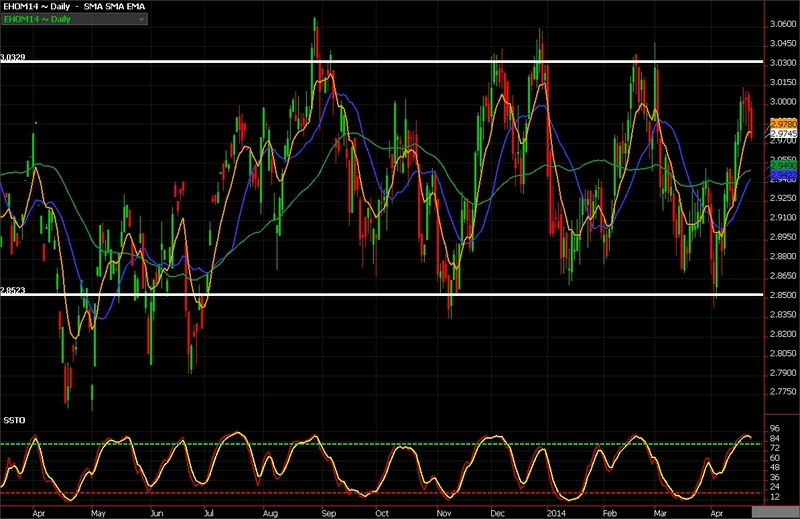 See chart 1 below for June heating oil futures over the last 12 months. I drew a a support and resistance line in white and one can see that for the most part futures have been in a 15-18 cent trading range. On a 42,000 gallon contract this represents a trading range of $6,300 to $7,560. Stochastics are overbought and futures appear to be starting to roll over. I see red in the last four sessions and prices are probing the 8 day MA ( orange line) as of this post. I am looking for a 10-15 cent break in the coming weeks. On a futures play get short with stops above the recent highs. This would be the more aggressive route as one would be risking ballpark $1300-1500 per contract. Size accordingly as I would suggest looking to make $1.50 – 2.00 per $1 at risk. 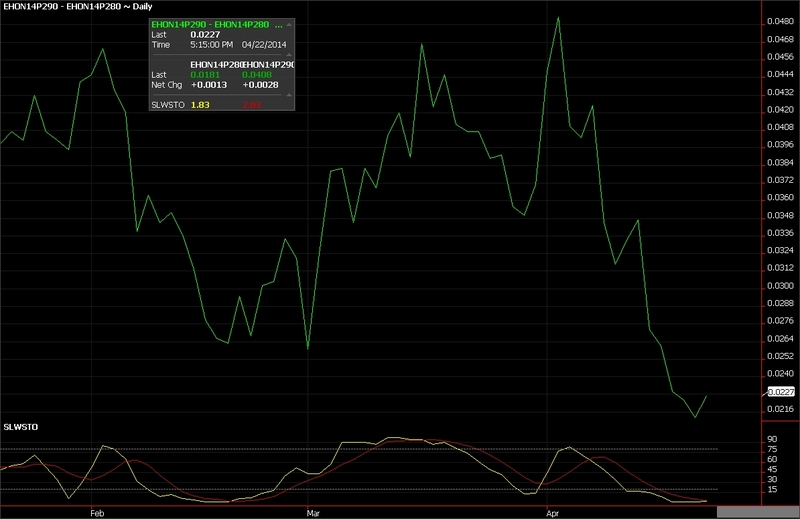 The second chart is an options play that I like buying July $2.90 / 2.80 bear put spreads. 63 days until expiration. Current pricing has July futures at $2.9775. Current delta on this strategy is 15%. 227 points on the spread represents a cost of 227 x $4.20 or $953.40. To talk about specific risk and exits strategies please contact me. This is NOT a buy and fall asleep at the wheel trade. 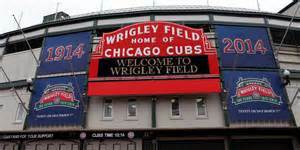 A special day in Chicago…Wrigley turns 100 years old!! Risk Disclaimer: This information is not to be construed as an offer to sell or a solicitation or an offer to buy the commodities and/ or financial products herein named. The factual information of this report has been obtained from sources believed to be reliable, but is not necessarily all-inclusive and is not guaranteed to be accurate. You should fully understand the risks associated with trading futures, options and retail off-exchange foreign currency transactions (“Forex”) before making any trades. Trading futures, options, and Forex involves substantial risk of loss and is not suitable for all investors. You should carefully consider whether trading is suitable for you in light of your circumstances, knowledge, and financial resources. You may lose all or more than your initial investment. Opinions, market data, and recommendations are subject to change without notice. Past performance is not necessarily indicative of future results. This report contains research as defined in applicable CFTC regulations. Both RCM Asset Management and the research analyst may have positions in the financial products discussed. OPEC’s Output Freeze: What Has Changed Since Doha?